There’s no denying that market trends change constantly, and trends in web design are certainly no exception. This ever-changing nature can be frustrating for business owners, but it doesn’t have to be. A smart business owner knows how to take evolving technologies in the market and use it to their advantage. A particular trend to take note of today is mobile responsive web design. While you might consider mobile responsive web design to be an added expense, it is a wise investment that will benefit your business in many ways. 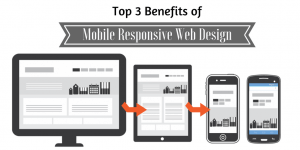 We’ve compiled a list of three major reasons why your business should look into creating a mobile responsive web design. Before we get started, you might be wondering what ‘responsive web design’ means. With a responsive web design, a website’s pages reformat themselves depending on the device they are being displayed on, providing a user-friendly experience no matter what device the page is being viewed on. This responsive design works by allowing your website to discover the height and width of the browser window that’s being used. It’s built with a grid structure that allows the content to be sized to best fit the browser window while the images within the web page automatically resize to fit the correct grid columns. Meaning it will literally respond to whatever screen size it is being used on. 1. User friendly: One of the best things about a responsive web design is that it can be called up on any device, including mobile phones and tablets — devices that are growing in popularity and use at an incredible rate. Recent trends have shown that users are shifting towards mobile browsing, rather than surfing the web on a traditional desktop screen, and responsive web designs are sure to give users a consistent experience with your business’s online presence no matter what. Responsive designs allow users to navigate your site with ease and familiarity. 2. Increased visibility: Your business’s success online is highly dependent on your visibility on the web. One strategy to make sure your business’s site stands out from the competition is through Search Engine Optimization (SEO), which is the practice of optimizing your website pages for better organic results when customers use search engines. Having high-quality content is vital to best-practices with SEO, and with a responsive web design, you can focus all of your energy on creating the best content on one site. One of the biggest challenges of having a separate mobile site for SEO involves building up the authority of each individual PC and mobile site. Many of these separate sites don’t do well in search engines, as they don’t receive as much traffic as their traditional counterparts. With a single responsive site, all of your searches and links route back to one site, which bumps up your traffic and visibility. You can hire a web design and Internet marketing firm to create a unified SEO strategy that spans across all devices, ensuring that your business is among the first options listed after the pay-per-click listings when a potential customer searches for your products and services. 3. Cost effective: A mobile responsive web design is a great way to make sure your business’s resources are being used as efficiently and effectively as possible. Because you don’t have to spend time and money developing a variety of sites to be compatible with PCs, tablets and smartphones; you can funnel those resources into creating one dynamic and professional website developed by a web design company. Overall, with a responsive website you only have one site to maintain and update, instead of multiple ones. A mobile responsive web design is a safe and smart investment for your business to make to establish a strong online presence. Our Minneapolis web design team specializes in providing affordable custom web designs, web development and Internet marketing services to businesses and organizations. For more information about responsive website designs, call our team of Minnesota web designers at (507) 581-9451.